Bosch’s kit includes crown stops which install on the left and right side of the saw. They’re essentially a couple of brackets with a slight lean to the edges, which make holding whatever shape you happen to have in place easy; they simulate the junction of the walls where you’ll install the trim. You also get a set of mounting knobs and hardware. Bosch notes that the stops “position out of the way on the tool when not in use,” but we can’t see exactly how that works. We suspect that unless you’re a pro and plan to cut nothing but molding, you’ll probably end up installing and removing these for specific projects, but that still sounds like a pretty decent idea to us. How often do you cut just one piece of molding? At least in my experience, I either cut no molding or a bunch of it. Hell, you should see some of the crazy shapes in my house. One room has at least six odd-angle meetings of walls. We’re not seeing these available via Amazon or most of the major resellers yet, but it looks like the whole kit should cost about $20-$25, which is pretty much what other similar products cost. For that kind of money, it’d be worth having one just for a single large project. 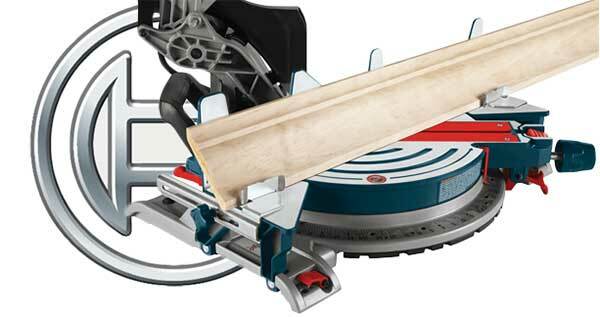 For those of you with the non-axial Bosch miter saws, you can use part #MS1228. I’ve been using them for years to cut crown on a Bosch 4410L. Looks like two small brackets that fit on the side with knobs and can be reversed and stored on board. Other than that, we sell a couple of crown jigs that do the same thing for about the same money. What would be great is if someone came up with a crown stop that held the trim in the saw as it fits on the wall. We spend a lot of time training customers how to cut upside down and reversed.